We love sharing stories about inspirational Star Wards journeys! In this blog we hear from Daniel Hughes, an Activities Facilitator at Northumberland, Tyne and Wear NHS Foundation Trust. Daniel works at Ward 2 which is part of Walkergate Park in Newcastle upon Tyne. The unit is a 16-bedded neuro-psychiatry unit for assessment and treatment of neuro-psychiatric consequences of brain injury acquired in adult life. They provide a regional service for the assessment, diagnosis and management of Huntington’s disease. Talking of staff who go the extra mile, here’s Daniel…. Eight months ago I started a new position as an Activities Facilitator with our Social Therapies and Recreational Rehabilitation team (STARRT). Although STARRT had input into Ward 2, we didn’t have a dedicated activities coordinator. I was seconded into this role from my substantive role as a Support Worker, which Michael fully supported and financed. It was around this time that I became interested in the Trust’s ‘Talk First’ initiative which has introduced many exciting ideas and is making it possible to develop new and interesting roles like mine. The Talk First programme is an initiative which aims to lower the use of restraint and incidents of violence and aggression across NTW. Through Talk First wards assess information gathered through Incident Report Forms and find solutions to lower or prevent violence and aggression as a multi-disciplinary team. These solutions tend to be holistic in nature as they will look at daily life on the ward as a whole, rather than just the immediate factors which surround incidents. The roll out of Talk First (which began in 2016) included our “Positive and Safe Strategy”. As part of the strategy all inpatient wards have been inducted into the Talk First, Star Wards and Safewards schemes. The strategy is all about reducing instances of violence and aggression across the organisation and our aspiration is for safer ward environments for everyone. I’d knew about this programme for a while but my new role provided a springboard to get more involved. Before taking on my new role I’d been working as a Support Worker two years. Thankfully, my new position gave me the opportunities and means to help implement some of the 75 Star Wards ideas. This blog is entirely my own perspective of the project. 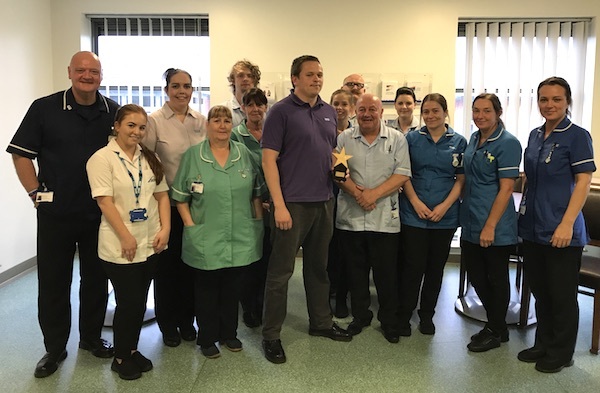 I feel Star Wards (along with the other schemes within the strategy) are as much about positively changing staff attitude as they are about improving the ward environment and patient experience. Ward 2 has always been a pleasant place to work, and we take pride in welcoming new staff members to the ward. Despite this though, introducing new ideas presented one or two challenges. There were members of staff who liked some of the ideas and were resistant to others. Some members of staff were neither here nor there with the 75 ideas. Other members of staff really took an interest in the ideas and were positive about the resulting changes. Some of the key Safewards ideas that we introduced were: the “Positivitree”, “Clear mutual expectations” of patients and staff, adding “positive words” to handover sheets, a “getting to know staff board” and bringing a notice board of “Soft Words” into the staff room for staff to see before starting the shift. Positive notes were also added to the handover sheets. These notes act as a reminder to talk about something positive about each patient – for example, something about the care they’re receiving, along with something optimistic and constructive that’s happening in their life at the time of the handover. In my experience, it’s all too easy for a handover to mostly focus on all challenging behaviour or ill health in the previous hours and overlook what’s good. By including positive notes, we are able to paint a fuller picture of each person and to develop a deeper understanding them. 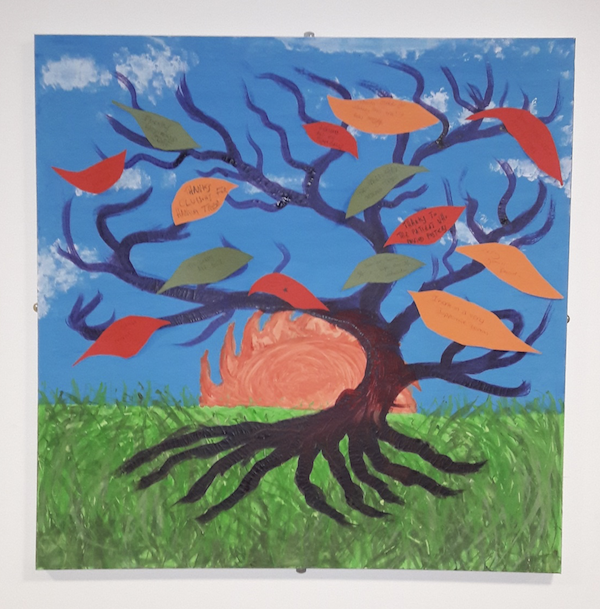 The ‘Positivitree’ is a large canvas tree which staff, patients and relatives are encouraged to write positive notes on card leaves and attach them to the tree. The tree is displayed in the main corridor for all to see and stands as a constant reminder of the positive times we have on the ward. 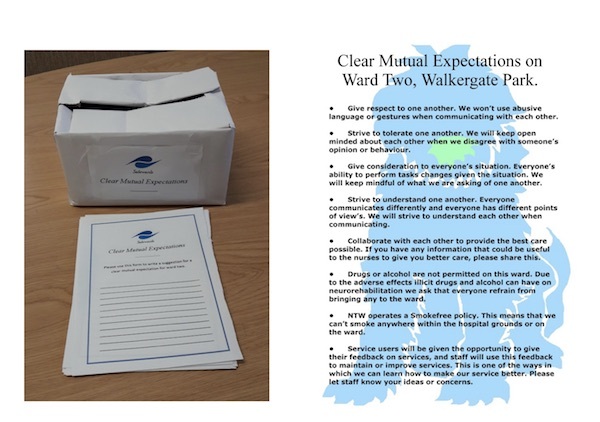 Staff and patients were invited to come together and agree on a set of “clear mutual expectations” which would outline ward values. Suggestions would be offered anonymously and discussed at patient meetings. The posters were then made and hung around the ward. The poster was also made into flyers and added to patient welcome packs. 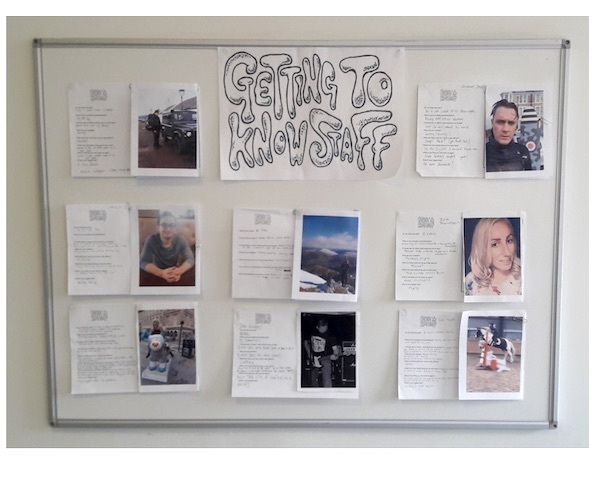 For the “getting to know staff board” the team were invited to answer a questionnaire and bring in a photo of themselves in casual clothes. This was to “re-humanise” staff and help staff and patients find common-ground. The 75 ideas were interesting to me as an Activities Facilitator in a therapies team for several reasons. A lot of the ideas have to do with giving patients the ability to engage themselves in therapeutic activity in one way or another. For instance, the very first idea is “Each ward has sufficient board games, a TV and DVD”. It might seem unthinkable to not have these but watching TV or a film wasn’t really seen as an “activity” before. Rather than just having a movie on in the room we now make an event out of it. Another idea was a “Decent ward and hospital libraries, including novels and magazines.” The ward has always had books and magazines around, but I’m not sure patients understood that no one specifically owned the literature and they were welcome to utilise it as they wish. Letting patients know about the books on the ward and the books elsewhere on site was part of the improvements that we made. Some of the 75 ideas simply were not met before the ward took an interest in Star Wards. For instance, the tenth idea “Activity co-ordinator” assigned for each ward created the post that I hold now. Before I started working for STARRT there was no activity co-ordinator for Ward Two and this idea wasn’t quite realised. We had tried to meet the requirement by assigning “Activity link nurses” but this proved insufficient as the work could not always be prioritised. Similarly, with idea 18 “Walking groups.” Of course, patients are encouraged to walk and engage in exercise often, but in implementing the 75 ideas we are now more proactive in getting patients off the ward and visiting the local park for a walk in fresh air. Idea 21 “Gardening by patients” was not previously met. We now have access to the “STARRT Garden” where patients are encouraged to tend to the plants and take responsibility for the garden’s upkeep. Although we’re currently losing a battle against the weeds, the patients who use the garden are proud of their involvement! Of course, not all the ideas were to do with activity and the nursing team had to change their practice to align with the ideas. For instance, 46 “‘Protected time’ for nursing staff, for uninterrupted patient contact” was an initiative that the qualified staff had to alter their practice to accommodate. There have been many positive effects of implementing the 75 ideas along with Talk First. Now the changes are in place, I feel Ward 2 is now a friendlier place to be for the patients and I believe we offer more holistic care than we did before implementing the 75 ideas. Some of the changes can be measured. Notably, over the course of the last eight months, incidents of violence and aggression have decreased steeply. Patients have engaged more in therapeutic activity and group activity is more frequent. They have more access to support groups, activities and more control over the care that they receive while they are on the ward. They’re coming along to patient meetings more, which is really brilliant to see. The facilities around the hospital are now utilised more frequently (for example, the library, multi-faith centre, garden and gym). Since introducing the ideas in we’ve been more proactive in promoting support groups for patients with Huntington’s disease. It’s rewarding to see patients who previously had isolated themselves in their bedrooms come out and engage with a support group for a couple hours. However, not all changes are measurable. Staff attitudes do appear to have shifted in favour of the 75 ideas. Staff members who initially were somewhat resistant to ideas are happier to get involved. Patients appear brighter in moods. Their relatives are taking a keen interest in the work we’re doing and are saying positive things about the changes. It’s been great to be involved in positive discussions about what we can do to improve things for patients and staff and be part of the drive to provide better care.